I often receive messages from my readers thanking me for posting about the important issues that so many educators face. I’ve been where they are; I’ve lived through a lot of the same things they have. And I love that we can connect, share our experiences, and work together to find ways to improve our classrooms, our schools, our communities. Recently, a friend and reader sent me a message about a career change she was considering. She was seeking my opinion—and a few words of wisdom. 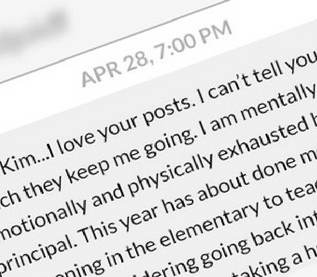 Mary is a high school principal and has reached a breaking point. She’s mentally, physically, and emotionally exhausted from the job. She’s been considering going back to teaching at the elementary school, something that she loves and misses. But she worries about the pay cut she’ll have to take, and she feels like a failure because she hasn’t made the progress she’d hoped for with her high school teachers. I told Mary that it’s amazing she has the courage to consider making a change that takes her personal happiness into consideration. That’s not failing at all—that’s success! That’s strength! She’s staying true to herself, treating herself with compassion, and listening to her gut instinct. I let Mary know that I’m truly rooting for her. I think a lot of educators have reached this same level of exhaustion, but many don’t know what next steps they should take. They don’t want to admit defeat. But in staying with the status quo, they’re ensuring they’ll never truly have professional or personal fulfillment. I was indignant! This wonderful, dedicated teacher should absolutely NOT sacrifice her weekends, and definitely not miss out on supporting her kids. Sure, we all want to be “highly effective,” but at what cost? Teaching is a challenging profession, one that often demands so much more than we can accomplish in 40-50 hours a week. So, I put my happiness coaching hat on and told my friend that sometimes we have to be OK with “effective.” When your mental health is on the line, when you feel forced to choose work over family time—that means it’s time to make a change and give yourself a break. Bottom line: I support teachers. I want to see you succeed inside the classroom and out. And when you feel like your sanity’s on the line, I’ll be here to offer words of wisdom and remind you that you are enough, your happiness is important, and you deserve to take care of yourself! Question: Do you ever feel like professional challenges, stresses, and worries infringe on your personal life? What are some of your tricks and tips for taking moments to prioritize yourself over the job? Share in the comments below. I’ve found the importance of adding consistent prayer time to help me stay grounded both on and off the job. I also have a staff member who consistently arrives at work early enough for the two of us to share a brief inspirational reading each morning.